It’s been over a month since release of Allegiant and I’m still trying to write a satisfactory review, it just seems like an impossible task. In fact my original draft review is ashamedly sitting waiting for me to look at it. It wasn’t good, or honest, or raw, it was more of a polite reaction to the end of what could’ve been one of the best YA dystopian trilogies. At this point, I think I really need to learn my lesson and not expect these trilogies to end well, they all simply underwhelm and disappoint [yes, I’m looking at you Matched and Delirium]. But don’t get me wrong, for all its faults I still believe Divergent series is one of the better ones out there and definitely worth reading. “I am not all right. I was beginning to feel that I had finally found a place to stay, a place that was not so unstable or corrupt or controlling that I could actually belong there. You would think that I would have learned by now— such a place does not exist.” Allegiant (p. 276). I might’ve not loved Allegiant and it wasn’t the greatest or strongest book in the series, but not because of the “shocking” character death that was causing so much backlash over the social media. Surprisingly, I found Veronica’s choice almost appropriate; this book needed it. [Yes. There, I said it – please don’t hate me.] I know it was a heartbreaking moment for a lot of fans out there, but not every book needs a happily ever after to be great, or even good and the world of Divergent warranted this sacrifice. However, my biggest struggle had to do with the characters themselves, their actions and the final reveal of the outside world. Halfway through I’ve struggled to keep myself reading; this, once creative world and idea of the story started to feel repetitive. The science tie-in, the experiments and hours spent between Tris and Four always fighting or making out, it was exasperating. We were stuck in a vicious circle of their broken relationship and there was no escape, things were falling apart, the cusp was so close that I almost wished for them to cross it. 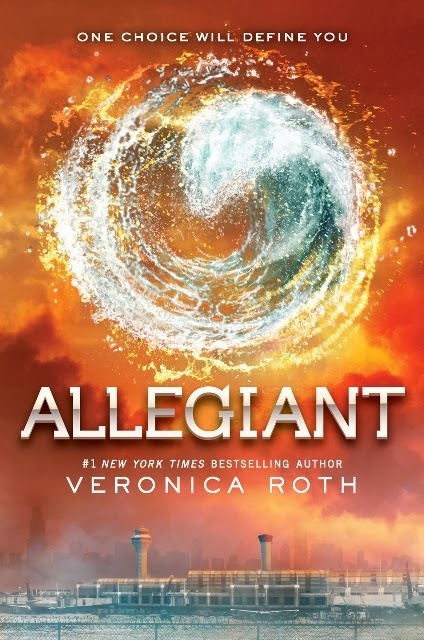 These characters were deeply flawed and I felt my love and investment in their relation deteriorating with each page, but perhaps it was also the glory part of Allegiant. Veronica’s goal was to portray broken people and see them improve and mend themselves in the process of their struggle and in that, she succeeded. There is clear character growth and development that beautifully underlines this harsh dystopian world, and at the end there is hope that something can be rebuilt but not forgotten, which I think is important. “There are so many ways to be brave in this world. Sometimes bravery involves laying down your life for something bigger than yourself, or for someone else. Sometimes it involves giving up everything you have ever known, or everyone you have ever loved, for the sake of something greater. But sometimes it doesn’t. Sometimes it is nothing more than gritting your teeth through pain, and the work of every day, the slow walk toward a better life.” Allegiant (p. 509). So whether you love it or hate it, this book certainly inspires enough emotion to make it worth reading. I loved both of the previous books and I thought this was a fitting end to the series, but weakest of the three. Still, Veronica Roth delivers a captivating tale that at the very least inspires discussion. You haven't read the 2nd yet? :) As I said above I thought first two were great! And the 3rd, well... it is what it is. It's there. But I do think it's worth reading. great thoughts!!!!!! glad to read them..and know.. i totally agree!